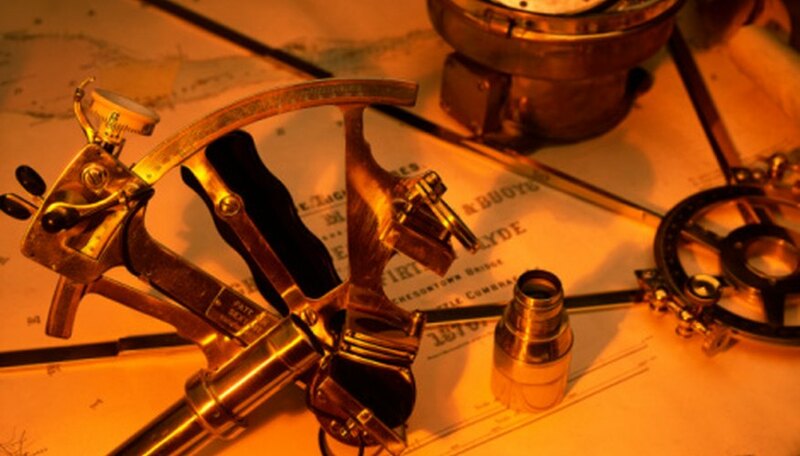 A sextant is a device used to measure an object's altitude angle relative to a horizontal line of reference. In the days before global positioning systems, a navigator aboard a ship would use a sextant to measure the altitude angle of prominent stars, such as Polaris, to navigate to and from the home port. In addition to a sextant, a navigator who desires to know his ship's exact position needs an almanac detailing the position of stars and planets over time, a method of telling time relative to the observatory that produced the almanac, and a method of mathematically computing his ship's location based upon the measurements of the sextant and navigational charts. Line up the straight edge of the protractor with the red line nearest the 6 inch edge of the note card with the curve of the protractor sitting on the card. Trace the curve of the protractor using your pencil. This line segment will be referred to as the "arc". Make a mark where the cross hairs on the protractor sit on the card. This point will be referred to as the "hub". Rotate the protractor 90 degrees keeping the hub lined up with the cross hairs of the protractor. The red line printed on the note card should pass through the 90 degree mark of the protractor. Mark the degree measurements at 10-degree increments along the arc. Label the degree measurements along the inside of the arc starting with zero degrees at the center of the arc. Increase by 10 degrees until you reach 90 degrees at the red line on the note card. Place small tic marks at 5-degree measurements between the multiples of 10. Draw line segments that extend from the hub of the circle to each degree measurement that is a multiple of 10. The pattern will resemble spokes on a bicycle wheel. Cut out your sextant along the arc. Unfold the paper clip so that it has a 180-degree "hook" at each end. Poke a hole in the hub of the sextant using your paper clip. Place one hooked end of the paper clip through the hub of the sextant and slide the other end of the hook over the edge of the arc of your sextant. The paperclip will act as your needle and should swing freely. Cut the straw to 6 inches in length and tape it along the flat edge of the sextant. The straw is your sight. Look through the straw at an object and read the altitude angle at the point where the paperclip crosses the arc of the sextant. When the long edge of your sextant--and the straw--is parallel with flat ground the paper clip should hang down at the 0 degree mark. Looking straight above you your sextant should read 90 degrees. Davis, Wesley. "How to: Simple Homemade Sextant." Sciencing, https://sciencing.com/to-simple-homemade-sextant-7448600.html. 25 April 2017.